The Creative Cloud Event Oxford, an in-depth review of the new features in Adobe’s Creative Cloud 2014 release, formed our July meeting. Over 90 creatives filled the Seminar Room at Said Business School on this very warm evening of Monday July 14th. Adobe specialists Niels Stevens and Tony Harmer presented an in depth whistle-stop tour of the new features in Creative Cloud 2014 for film makers, photographers, artists and designers. Tony Harmer started the night with Adobe Mobile Sketching showing Sketch, Line, Ideas, Photoshop Touch, Photoshop Mix and Lightroom for iPad and iPhone. In Illustrator Tony showed improvements to Pen Tool, Live shapes, Live corners, the Rebuilt Pencil Tool, CSS Properties Panel, SVG options and Custom toolboxes. Moving on to Edge Animate Tony showed a simple animation and a basic interactivity demo. Continuing his high-speed tour Tony then moved on to Photoshop, showing the Focus Area selection, Refine Edge, improvements to 3D and 3D printing, Perspective Warp and Smarter Guides. Opening InDesign he showed the inclusion of .oam files from Edge Animate and Exporting to EPUB fixed layout before finally talking about Typekit support in all Creative Cloud 2014 applications. “All the recorded clips of this year’s World Cup that were shown on the BBC were edited exclusively in Premiere” and there are currently over 2.3 million paid Creative Cloud subscriptions worldwide said Niels Stevens as he talked through the new features in the video tools in Creative Cloud 2014. He also told us that Premiere was featured as a part of the new film Last Showing starring Robert Englund (see the Premier UI 1m 16s in this clip). In Premiere Pro Niels showed the new Live Text templates and Typekit integration, masking and tracking features for video editors to blur out faces, logos, license plates, or anything else throughout a scene; and to add a feathered mask that automatically moves with the action. Enhanced graphics performance in Mercury Playback Engine, streamlined voiceover recording, faster editing workflow and faster rendering with mercury playback engine. He talked about automatically backing up of Premiere Pro projects to the Cloud. Finally Niels demonstrated master clip effect changes rippling down through every part of the clip in a sequence. Thank you to Adobe, Niels and Tony for a tremendous tour of the capabilities of Creative Cloud 2014. 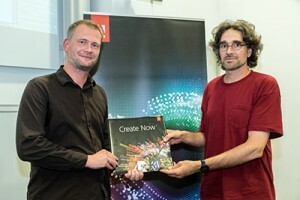 Winner of the event raffle, John Lobreglio, was presented by Niels Stevens with a one-year free subscription to Creative Cloud. Next meeting: Our next meeting is in September as we take August off to enjoy the summer. On Thursday 18th September we return to Film Oxford on Catherine Street for another Portfolio Show-off Night. This is the night where we invite you to share your portfolio with us all and show off your creativity. This is not a critique night it is an exhibition, a night to show what you do. Digital or physical, complete or work in progress, bring your work along and spend up to six minutes showing to everyone – no need to book, just turn up on the night. Meanwhile, enjoy the summer! Thanks for all the Gelato Liz! For our June meeting developer Liz Myers stood in at the last minute for Matt Gifford. Many, many thanks Liz. Liz has been developing her app @2ScoopsApp which alerts users to the best gelato in shops in London, Paris, Rome and New York. The app works on geo location of the user’s phone and shows the details of gelato retailers, opening hours and contact details along with comments on the store and its products. Originally from Minnesota, Liz worked in publishing for Microsoft where she switched to mobile development where she ‘got the bug’ before moving on to work for Blackberry. Liz is now an Adobe Community Professional and she outlined some of the announcements Adobe had made the previous night, particularly mentioning the Creative Cloud Photographer’s package and the student’s reduced rate for Cloud membership. Turning to developing her app Liz pointed out the importance of using use cases as the key to design, deciding in this case that ‘find’, ‘enjoy, ‘share’ were some of the key uses of the @2ScoopsApp in addition to deciding the likely people who would be users, on what type of device and under what circumstances. In addition Liz commented on the importance of connecting the app to incoming Twitter feeds regarding the stores. Whilst displaying images and details of the products the app plays Italian voices to describe them in order to enhance the genesis of the gelatos. Commenting on the development of the app’s code Liz stressed the importance of ‘test early, test often’. Liz suggested using jQuery Mobile for app development, stressing the importance of always using the latest stable version. In her development work Liz uses the Adobe Edge tools as they are tightly coupled with PhoneGap. 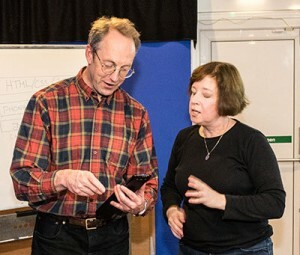 In particular Liz mentioned the ease of multiple device testing using Edge Inspect which instantly propagates and displays on multiple mobile devices connected to the same mobile network the effects of code changes. myersdesign.com has much greater detail regarding @2ScoopsApp which is due to go into production live before the end of the summer. 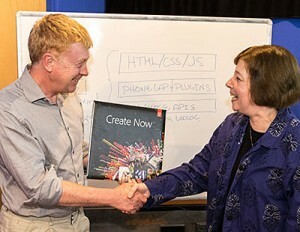 Roger Knight, winner of the Creative Cloud raffle prize. The final activity of the evening was to draw the raffle for a one-year free subscription to Creative Cloud. This was won by Roger Knight, congratulations Roger.